We're back with live finals results from McCorkle. Through two days, @BadgerSwimDive is fourth. Harrison Tran will be the first Badger up to the blocks tonight in the 100 fly B-final. He will swim in lane 2. Tran swims a 47.26 for 14th overall in the 100 fly.
.@cannonclifton94 next up in the 100 fly A-final in lane 7. He's hell-bent on breaking Dan Lester's school record tonight. Podium finish and school record for Cannon Clifton! 45.81 in the 100 fly for third place. He's the first ever sub-46 Badger in this event. That makes 4 school records on the meet for Clifton. He's absolutely on fire - and he recently announced he'll continue to train postgrad. Next up is the 400 IM C-final is @cooperhodge91 . He will swim out of lane 5.
Cooper Hodge gets points on the board for the Badgers as he finishes 23rd in 3:54.43. Todd McCarthy and Michael Milinovich are in the water for the 400 IM B-final. MICHAEL MILINOVICH! 3:46.04. Five hundredths of a second faster than Bushman of Minnesota to win the B-final and take ninth overall. Maloney and Lyons are the first two of seven Badgers to swim in the 200 free finals. Sean Maloney wins the C-final in 1:35.91 to take 17th overall. Lyons takes 23rd in 1:37.05. B-final featuring Ryan Stack, @GoicoVictor and Ryan Barsanti in the water now. Big points for Wisconsin in the B-final - Barsanti 12th, Stack 15th, Goicoechea 16th. Brett Pinfold and Matt Hutchins getting ready to hit the water in the A-final. 4th place for Brett Pinfold (1:33.85) and 7th for Matt Hutchins (1:35.32)! 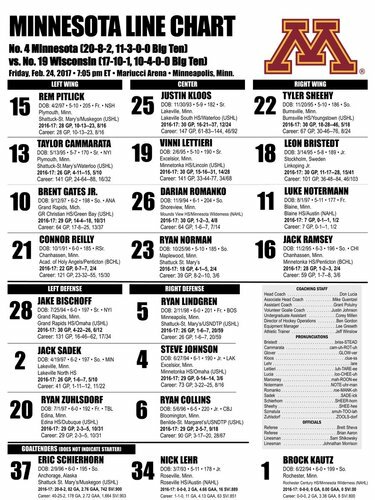 Under an hour to puck drop, #Gophers !
. @chris_willis2 with a 24th-place finish in the 100 breast in 55.56. 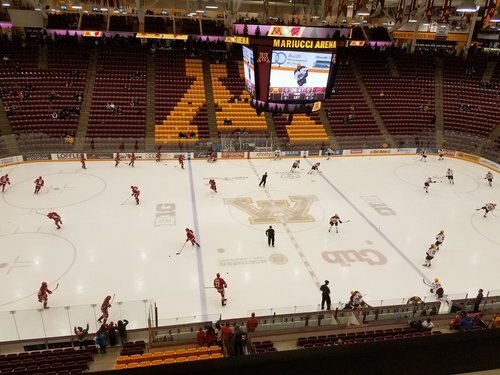 Prince's "1999" is the Gophers' first song for warmups. 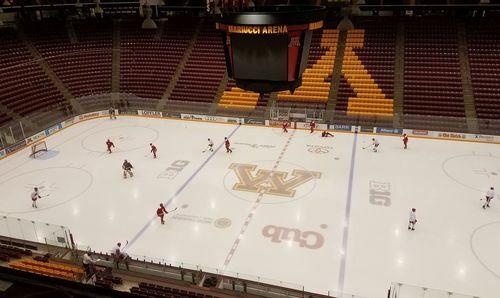 The Badgers were 1-0-1 at Mariucci in 1999. This is a big one. 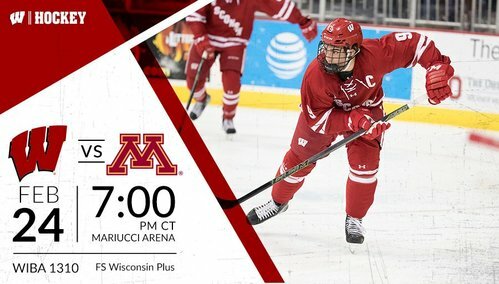 Badgers and Gophers just about half an hour away. 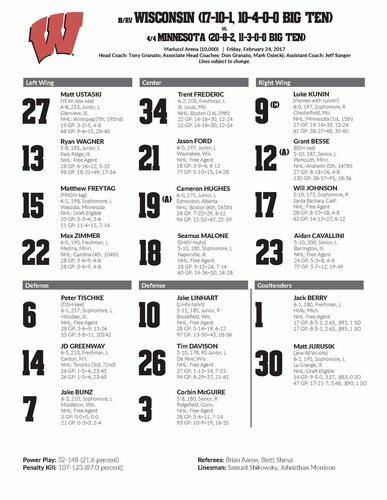 Jack Berry starting in goal for the #Badgers . 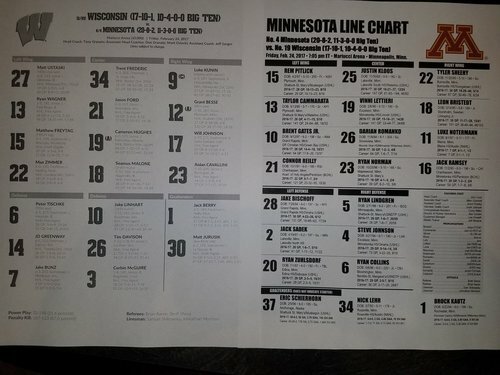 Eric Schierhorn for the Gophers. Five minutes until the puck drops in Madison for WCHA playoff hockey between the #Badgers and Minnesota State. Game 31: HEY. DROP. THE. PUCK. #GOPHERS GOAL! Lettieri banks one in off Berry just 28 seconds in to put Minnesota up early! 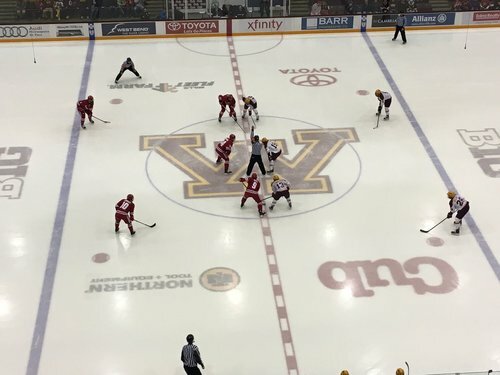 GOPHERS GOAL: Vinni Lettieri banks the puck in off Berry's back 28 seconds in, and it's 1-0 Minnesota. 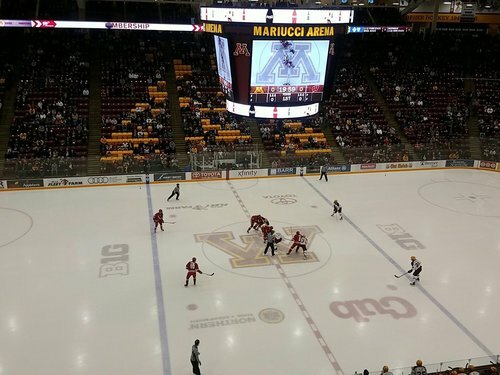 Gophers score just 28 seconds in to take a 1-0 lead. Ramsey picks the pocket of a Badger to break up a potential shot. 16:59 to play in the first period and the #Gophers lead 1-0. 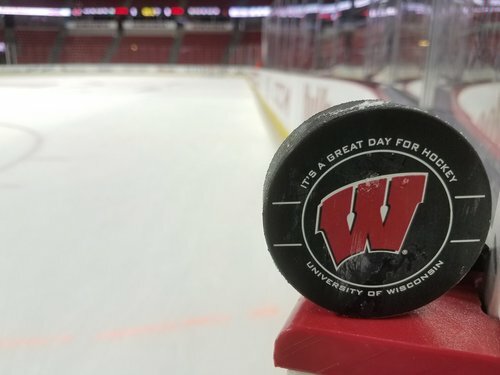 It took UW 4:45 to get its first shot attempt (Besse, blocked) and 5 minutes for its first shot on goal (Hughes, saved). Schierhorn's first save comes exactly five minutes into the game. Media timeout with 14:07 to play.